Rapid, bubbly trill that rises and falls in pitch. Call is scolding “trrrrr,” and a harsh buzz. Description: Sexes similar. 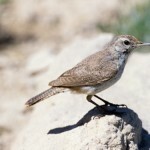 Brown above with faint crossbarring; pale below; faint eyebrow; long, slightly curved bill; and short tail. 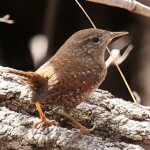 Distinguished from Winter Wren by longer tail, less prominent barring on belly, and larger overall size. Juvenile has a bright rufous rump, and darker buff on lower parts. Habitat: Found in deciduous forests, open woods, riverbottom forests, and wooded hillsides or canyons. Also city-adapted, and frequently nests in birdhouses. Where in Nebraska: Common spring and fall migrant and summer resident across the state, becoming abundant in the Missouri Valley forests. 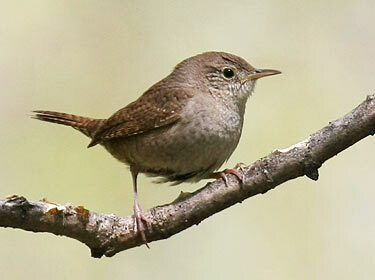 Fun Facts: House wrens weigh the same as about two quarters. They may use spider egg sacs to line their nests to help keep mites and other parasites from eating the nestlings. Additional Information: Often seen as a birdhouse pest, as they will throw out the nest, eggs, and even the young of other birds. In the process it may even kill the adult attending the nest.